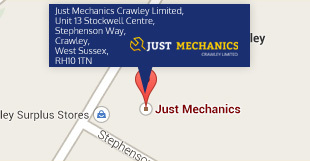 For professional and affordable vehicle repairs from an RAC approved centre for car servicing in Crawley with full RMI accreditation, visit the team at Just Mechanics today. We deliver a complete range of modern automotive solutions for customers in the local West Sussex area. Our workshop caters for all makes and models including passenger cars, 4X4’s and light commercial vehicles. We are a VOSA registered testing centre providing fixed-price MOTs in Crawley at just £49.00. What’s more, we never charge additional fees for a retest even if you have the work undertaken somewhere else. At Just Mechanics, we undertake all MOTs up to one month in advance of your current certificate’s expiry date. Save money on traditional main dealership costs and keep your warranties intact by choosing Just Mechanics for car servicing in Crawley. We work to manufacturer service schedules and we always use OEM compliant parts to deliver high standard scheduled and interim servicing packages. We are open until 6.00pm on weekdays and until 2.00pm on Saturdays. I have found these guys brilliant, if possible, they will fix without replacing parts. They are happy to fit my supplied parts and I ave never had an issue with their diagnosis of problems. Would recommend to all. I never had a problem here and no one I know has, I highly recommend them!